Sign up to the blog! Enter your email address to subscribe to this blog and receive notifications of our latest products, news and exclusive discounts by email. Cycle garage – repair your bike in the garden in your asgard bike garage! With the tension between cyclists and motorists reaching boiling point, something positive is finally being done to tackle the number of cyclist deaths on Britain’s roads. Learner drivers will now be taught bike awareness, thanks to two of the UK’s biggest driving schools AA and BSM. Both of these driving schools will include a new segment on driving safely around cyclists. Driving instructors will undergo training backed by the Driving Standards Agency and the Department for Transport, to enable them to educate new drivers. This is a great step in making UK roads much safer for cyclists to use. However, there will still be thousands of motorists, who won’t have undergone such training and have a negative attitude towards cyclists on the road. This negative ‘I own the road’ attitude is what causes accidents and fatalities between cyclists and car drivers on our roads. Hopefully this new segment, will be enforced and be a must have for all learner drivers and tested on the driving theory test. What is the best high security bike storage? Fitted with a range of strong high security features to keep your bikes protected from theft. Take a look at its key features here. This bike shed features tough door bolts as an added security measure. All Asgard metal bike sheds are all made from galvanised (weatherproof) steel, for tough storage. The Annexe secure bike storage unit boasts reinforced doors, panels and hinges for the best bike security. Heavy duty hooks are available to purchase, these are ideal for hanging helmets and cycling accessories. These hooks are easy to fit as Asgard sheds are already pre-drilled to accept them. Bad weather is no match for the Annexe bike shed, as it is fitted with an integral rain guard designed to keep the bad weather out! Heavy duty, galvanised steel shelves are available to purchase. Keep all of your cycling gear stored with your bikes. Asgard bike sheds are fitted with a full integral metal base for security, this metal base can be bolted to concrete for extra tough storage. The Annexe high security bike shed, has been approved by the Loss Prevention Certification Board to level 1, which may help to reduce insurance premiums. Fitted with a euro cylinder pick resistant locking mechanism, for the best bike security. The Annexe has a tough 5 point locking system, designed to keep thieves out! Take a look at the full range of Bike Sheds from Asgard. 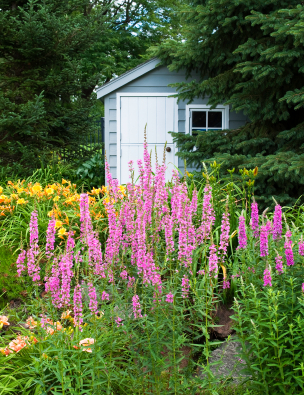 How much is your garden shed worth? Is your garden full to the brim? You’ll be surprised at how much the items stored in your garden shed are worth. A study conducted by Net Voucher Codes, found that in the average garden shed £2080 worth of items can be found. Worryingly this study also revealed that 29% of people don’t put a lock on their sheds. The most valuable items found in a garden shed are bikes, with the average family storing £600 worth. Now that you know the amount of money that is sitting in your garden shed, you should become more careful when it comes to storing your items securely. Putting a lock on your garden shed is the very least you can do to protect your garden shed from theft. As we know, garden shed theft is a very real problem and these only increase during the summer months. A garden shed alarm is also another way to protect your stored garden items. A motion sensor shed alarm is available from Asgard, the home of secure steel storage. However, if you would like something more substantial, Asgard has a range of metal garden sheds. These are sturdier and more robust than the average wooden garden shed. Made from tough weatherproof steel, these metal garden sheds are fitted with tough pick resistant locks to help keep thieves out. Find out more about Asgard on their website. The Asgard Double Ended Bike Locker, is the best way to share bike storage in a secure way, without leave your bike at risk to theft. This bike locker allows you to store 2 bikes independently, ideal for sharing! This bike locker is designed to store up to 2 bikes separately of each other. Heavy duty hooks are provided with this bike locker, perfect for hanging helmets. This bike locker is designed to be shared, an internal locking point has been included as an added security measure. Asgard bike lockers are supplied with fixing bolts, which can be used to secure the bike locker to a concrete base for added security. A 3 point locking system is fitted to both doors on the Double Ended Bike Locker. Each door is operated by a different key, for private individual access. This bike locker is fitted with a euro cylinder pick and drill resistant lock. A steel divider is fitted inside this bike locker, to securely separate your bike from the other. The Double Ended Bike Locker is made from strong galvanised (weatherproof) steel, as are all Asgard storage units, for the toughest bike security. Asgard bike lockers are easy to assemble and are provided with step by step instructions. An installation service is also available. This bike locker is designed to provide space saving bike storage and is ideal for sitting down the side of a house or flat. View the full range of Asgard bike storage to find the perfect bike store for you. Thinking about getting a quad bike? 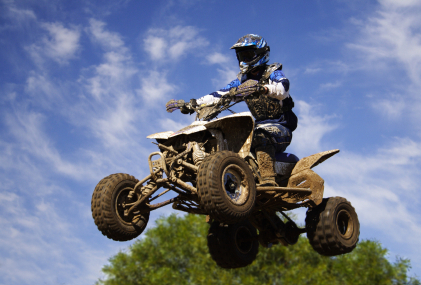 Here are a few things that you need to about the law and riding a quad bike. Do quad bikes need to be registered and taxed? Quad Bikes must be registered with the DVLA and the bike must have number plates. However if you are using off-road, you do not have to tax or register your quad bike. 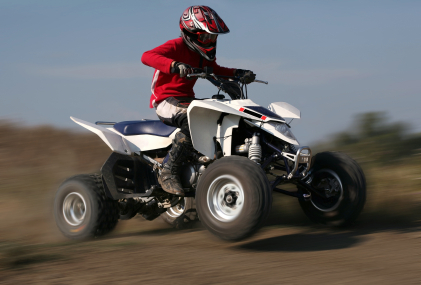 Does a quad bike need an MOT certificate? A quad bike that is being used on the road will need a valid MOT certificate if the bike is more than 3 years old. Do I need a driving licence to drive quad bike? To be able to drive a quad bike on the road you will need to have a full car licence or a category B1 licence if it was issued before January 1997. However if you are using your quad bike off road, you don’t need a driving licence. Do I need insurance to drive a quad bike? To drive a quad bike on the road, you must have a minimum of third party insurance. Can I carry passengers on my quad bike? If you want to carry passengers on your quad bike, you can only do so if your quad bike is designed to carry passengers and has the correct number of seats. Do I have to wear a helmet when on my quad bike? You do not have to wear a helmet while driving a quad bike, but it is recommended. When buying anything used, you should always carry out a thorough inspection. Buying a used quad bike is no different, below is a list of things that you should check out before making your purchase. 1. Inspect the undercarriage for any serious dents or damage. 2. Check the frame inspecting the shock mounts, A-arm mounts and intersections for any signs of rust. 3. Check the engine oil to see if it is contaminated. 4. Use a torch to look for any rust in the gas tank. 5. Take a look at the air box and filter, as this can collect water and damage the engine. 6. Test all lights, the engine shut off switch and key switch. 7. Test all of the brakes, making sure they operate correctly and look out for damaged or cracked cables. 8. Inspect the exhaust, looking out for any holes. 9. Check the steering by moving the handle bars back and forth. This will identify worn tie rod ends or steering stem bushes. 10. Check the condition of the tyres, making sure they are not too worn. If so you can negotiate on the price of the quad bike. When you purchase your new quad bike, make sure you keep it locked up securely. Quad bike theft is on the rise, especially in rural areas, protect yourself from becoming a victim. Asgard has a secure quad bike garage, designed to keep your quad bike/ ATV safe. Made from strong weatherproof steel and fitted with high security features for tough storage. Find out more about this quad bike garage on the Asgard website. If you are looking for large storage for your gardening to keep anything from old empty plant pots to garden furniture, look no further. Asgard large metal sheds offer fantastic outdoor storage in a range of sizes and are fitted with a wide range of features. All Asgard metal garden sheds are made from Weatherproof steel, for the toughest storage. There are no dangerous exposed screws or sharp edges. Even though they are big, Asgard large metal garden sheds are easy to assemble and come with step by step instructions. An installation service is also available. Shed accessories such as hooks and shelves are available to purchase and allow you to maximise your storage space. Asgard sheds are fitted with a unique ventilation system to minimise condensation. The integral metal floor adds more security to the metal shed. Metal sheds are low maintenance. All Asgard sheds are suplied with a 10yr warranty as standard. This pick resistant locking mechanism helps keep your stored items safe. Tough locking systems help keep thieves away! See the full range of large metal sheds from Asgard.